Welcome to the RevKit Website! RevKit is an open source toolkit for reversible circuit design. The motivation behind it is to make recent developments in the domain of reversible circuit design accessible to other researchers. Therefore, a modular and extendable framework is provided which easily enables the addition of new methods and tools. In this sense, RevKit addresses users who simply want to apply the framework and its tools as well as developers who actively want to develop further methods on top of the framework (learn more about RevKit and the currently included approaches on this page). 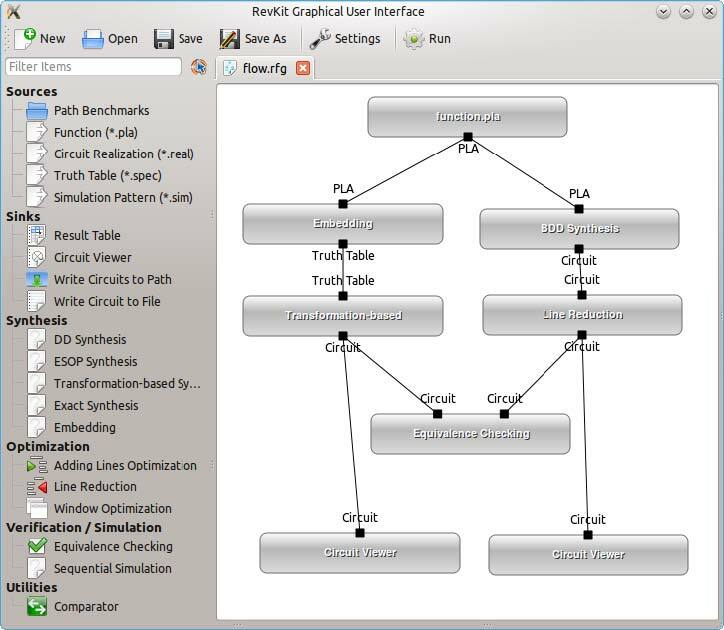 The fastest way to become familiar with the framework and its functionalities is to apply the RevKit Graphical User Interface (see screenshot on the right-hand side). The use of the RevKit GUI is briefly illustrated by means of several tutorial-videos at this page. For more details, we refer to the documentations, which provide all necessary information with respect to two different perspectives. Choose the users' perspective if you want to apply the RevKit and its tools without modifying the code. Choose the developers' perspective if you want to use RevKit in other C++ programs or if you even want to extend the framework by own methods. Download the newest version of RevKit. Everyone is welcome to contribute to RevKit. RevKit supports the RevLib file format. Get functions and circuits there.